It's been presented the Telestroke Network, that plans to establish the pilot Hub center at Centro Neurolesi Bonino Pulejo of Messina and four Spoke districts: Cannizzaro in Catania, Sant'Elia in Caltanissetta, Sant'Antonio Abate in Trapani and Villa Sofia in Palermo. Today IRCCS San Camillo of Lido of Venice will host the third edition of the prize named after Dr. Lamberto Piron for the best scientific research. "It 's the best way to honor the memory of the brilliant researcher and great physician who was Lamberto, that is terribly missed by all who have had the fortune to know him." Comgratulations to the winner of this year, Eng. 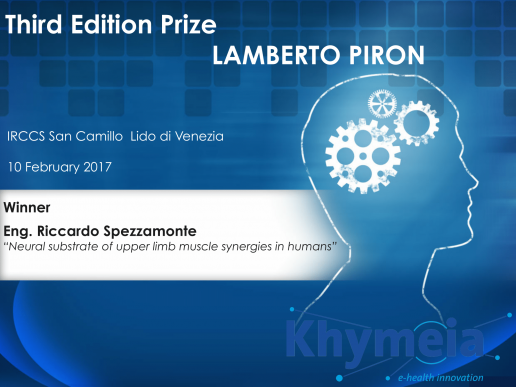 Riccardo Spezzamonte with the research “Neural substrate of upper limb muscle synergies in humans”!